And yes, I am doing all these things. Carpe joy! My new demo video! What do you think? Fabulous event last week for Marquette Group one of my favorite clients. Now if you have no idea what tsuris is, it's a Yiddish phrase for stress and hassle, both of which I experienced on Friday. If you live in Chicago or watch the weather channel elsewhere, you know we had horrendous storms rolling in and out all day. After a two month hiatus from travel, my first day back was the proverbial nightmare. Nine hours in the airport, delayed, canceled but wait...I learned a long time ago as a woman road warrior that you can't let that get to you or else you shouldn't travel. I went to the airline club, took out my computer, my books and mags', got some healthy snacks, a cup of tea, settled into a comfy chair and worked in a relaxing manner and time flew even though I never did! I love my dog! Brat is a 13 year old Llasa Apso (that's Tibetan). My son Jason has a wry sense of humor so Brat wears a dog tag that says "Free Tibet." In February Brat was stumbling on occasion so I took him to my vet. He couldn't find the cause so he sent me to a neurologist...that's a whole other story. Let me just say I didn't do enough homework before entrusting my precious pooch to this guy and as a result of his "tactics" Brat became totally handicapped, losing all capabilities of ever walking normally again. Tenacity being my middle name I was "dogged" in finding all possible solutions. On to an orthopedic vet and finally a naturopathic vet and thousands of dollars later there was no answer. I bought a harness, vitamins, he had acupuncture, laser therapy and even considered a doggie wheelchair. Then the moment when well-intentioned friends suggested putting him down. Herein lies the story. He is not in pain, never has been in pain but my own observations and all the vets' concurrence..he is simply physically challenged. He is happy, he is loving, he has adapted brilliantly to crawling, peeing and pooping and playing. I would no sooner "put down" a relative who became handicapped then I would this member of my family and so I too have adapted. Enjoy the photo of Brat in his little red wagon. 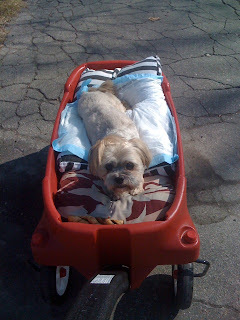 I take him to the park, I sit and read for half hour (good for me) and he lies in his wagon basking in the accolades of all passersby who think he is so cute...he is! There is no moral to this story but I think there is a life lesson for me and it reaffirms what I've always believed in...trust your heart and your instincts, love unconditionally, never give up until you've exhausted all your options, then listen to your heart and your instincts. Now go pet your dog!!! Who knew when I created that program two decades ago that I was way ahead of myself. I was an accidental brand. I created my brand inadverdently and then one day, I realized what I had done. 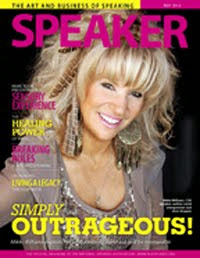 Now I am hired to speak about it, coach others on how to do it and this week doing a teleseminar on it. I believe everyone should have a personal brand no matter what business you are in. People buy people, people buy on emotion, people buy authenticity. Stop talking about what you do and start promoting who you are.Start using your name, not your company name, start using your persona, not your product. Don't be different, be unique. If every realtor is selling condo's, become the beachfront property specialist. If everyone is selling cookies, become a "Famous Amos" a personality. You all have a personality! Not everyone is an extrovert, that's no excuse. Just be who you are and exploit that uniqueness. As I love to quote myself, (lol) "Be outrageous, it's the only place that isn't crowded!". Introducing The Reverend Mikki Williams! The weekend had a 1920's/nautical theme. 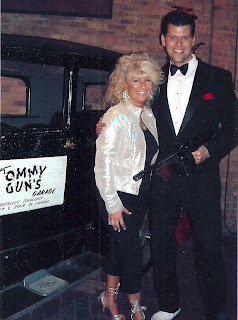 Friday started with an evening at Tommy Guns Garage, Chicago's only original speakeasy dinner theatre. Saturday afternoon was a private architectural cruise followed by lunch at Fulton's on the River. We were picked up Saturday night at The Drake Hotel where most of the out of towners stayed, in a gorgeous black 1920ish Rolls Royce or Bentley or something like that. We then boarded the Celebrity Yacht at Navy Pier for a nautical wedding and celebration. The deck was set with chairs for the 50+ guests, I stood under the altar schmoozing with the audience to stall for time till we were out towards Monroe Harbor. (I think it was the schmoozing part that got me the job;-) Then the ceremony, they wrote, I wrote, google wrote. Phil cried, his gorgeous teenage kids, Jack and Annie stood up for them. I made a funny..."when you're wrong, admit it, when you're right, shut up, you can either be right or you can be married!" After the "I do's", we had hors d'oeuvres on deck then went downstairs for dinner, traditional cake cutting and music. At 11PM as we were headed back close enough to have the Sat. nite fireworks at Navy Pier as the backdrop, Phil and Anna did their first dance as man and wife and the setting was spectacular. The white Rolls awaited the departure. Sunday was a trolley ride to all the significant places where Phil proposed, where they met, where they live and highlights of our fair city. The weekend celebration ended with a brunch at Gibsons. It was definitely one of the highlights of my life to be honored by marrying friends...and to be able to check it off my infamous "experience list".